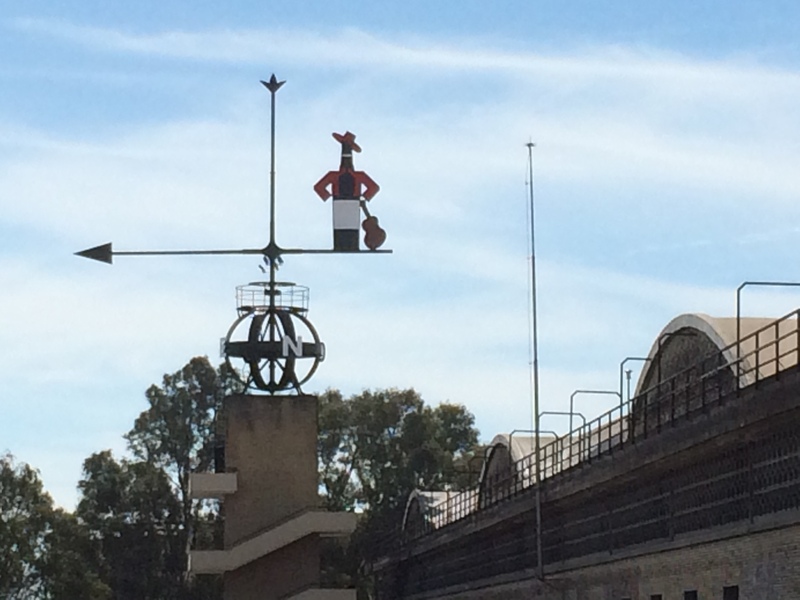 Dorianne and I spent Easter weekend in Jerez, Spain, both to take a break from the hectic Santa-Semana schedule in Seville, and to explore a bit of Sherry country. 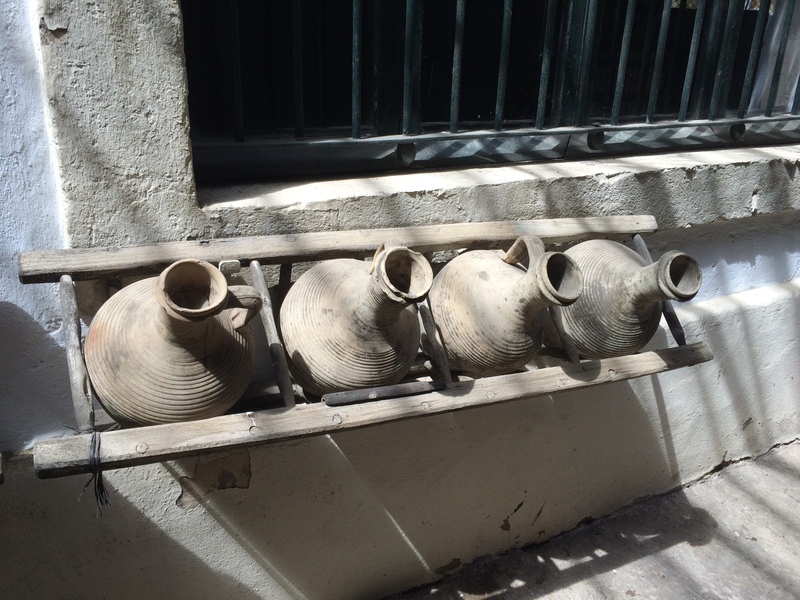 Andalusia, the southwestern region of Spain is known for its production of Sherry Wines. Lobby and Waiting Room for the Tours. 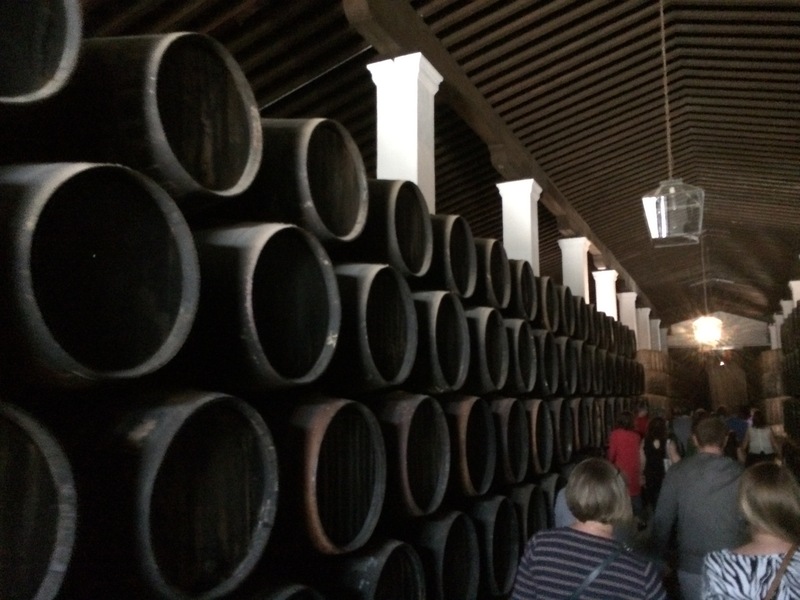 There are a number of bodegas or Sherry houses in Jerez. The only one open on Good Friday afternoon was Gonzalez-Byass (LINK), makers of the best-selling Tio Pepe and a number of other Sherries and brandies. 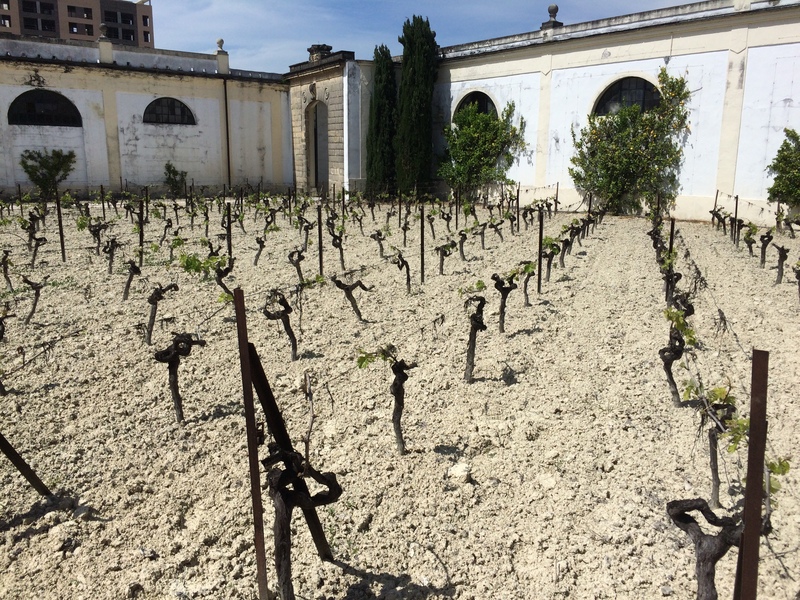 Gonzalez-Byass is the largest Sherry producer and also has wineries in every major Spanish Wine Region – they are sort of the Mondavi of Spain. 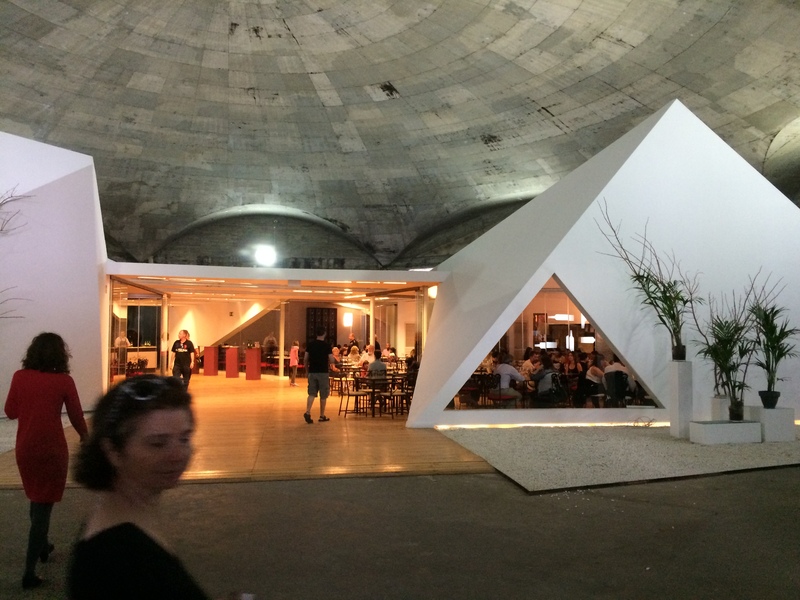 The bodega is located adjacent to the Cathedral of Jerez and The Alcazar – prime real estate to be sure. The tour cost 16 euros, including a tasting of two wines and a plate of tapas. Gonzalez-Byass is a big operation, and the tour was extensive. There were groups taken out in Spanish, English and German while we were there. You also take a tram for part of the tour. 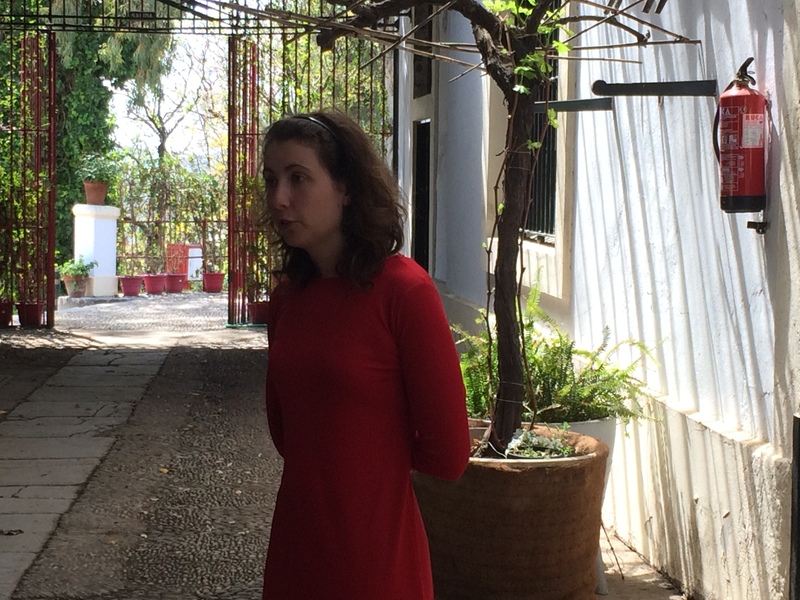 It is very touristy, but I was impressed at the amount of information provided by our guide, Rachel and the expanse of the bodega. 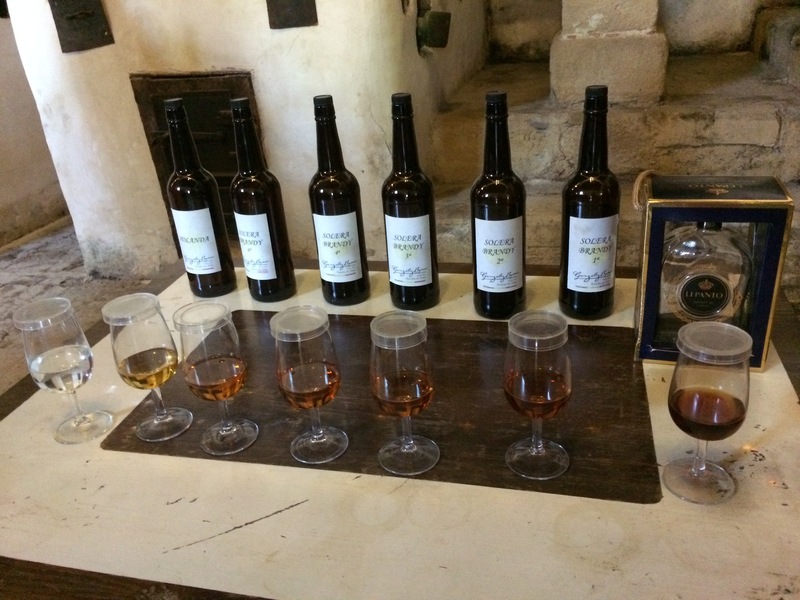 The tour is not an intimate experience, but it is a great introduction to Sherry wine production. Sherry is made with only white grapes, primarily palomino, which grows well in the gray soil of the region. Dry Sherry or Fino is made from earlier harvests, sweet sherry or Cream or Dulces is made by adding late harvest grapes to the blend, in some cases, raisins. 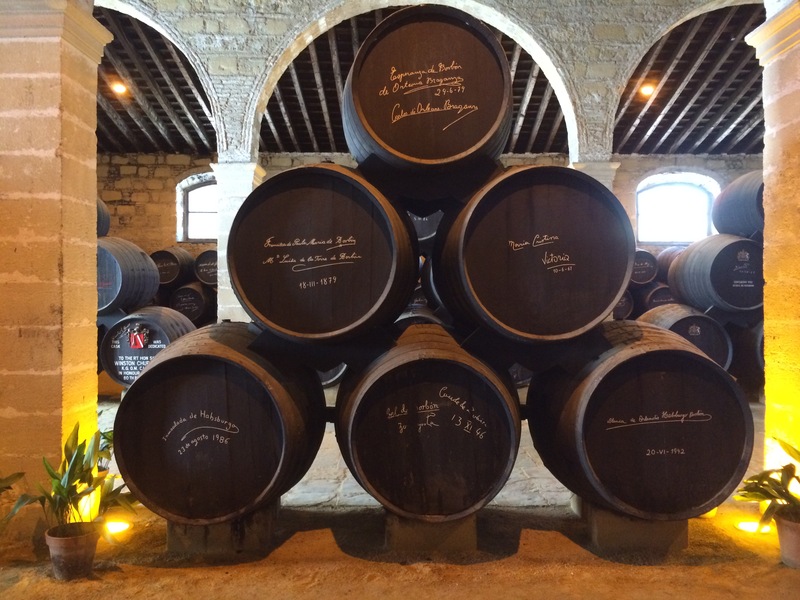 Almost all Sherry is blended – a process where there is a stack of barrels four high. The bottom barrel contains up to 60 vintages, the second barrel is newer, the top barrel the current vintage. The winemaker takes 1/3 of the bottom barrel and then replaces that 1/3 with wine from the second barrel, and so on. Some from each of the upper barrels is added to the current wine being made. This, according to Gonzalez-Byass, results in a uniform product over time. There are some vintage Sherries, which are not made using this process. The grey soil of Andalusia. 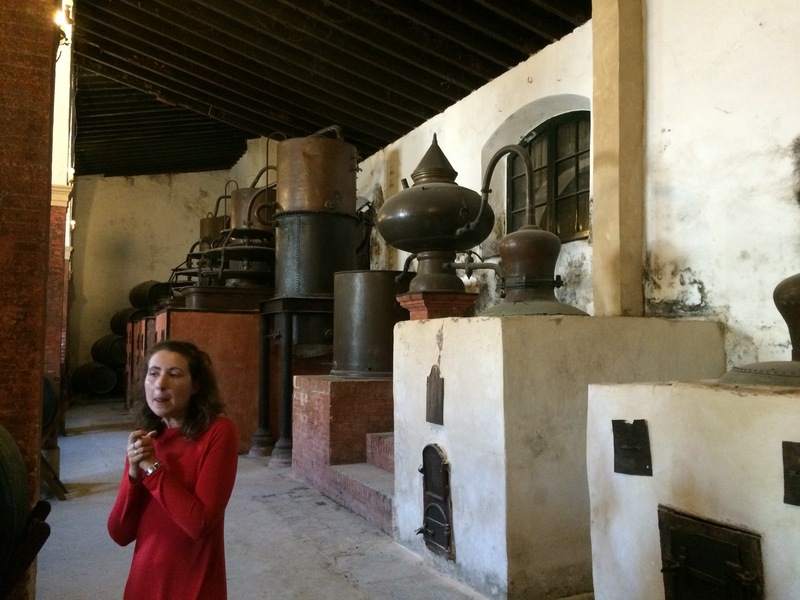 Rachel shows us the Old Brandy Stills. Here is a good PDF showing the process of making Sherry wines (LINK). 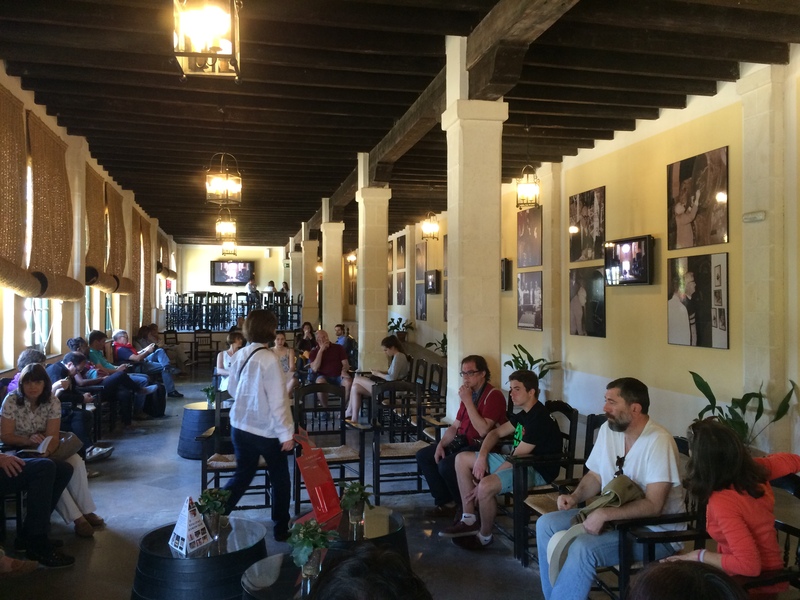 The tour concluded in a very modernistic tasting area built inside the storage building for Tio Pepe wines. We tasted three wines – a Fino, a Cream, and a Blend, and had tapas at a table shared with a mother and daughter from Moscow who had taken the English language tour. They told us about Russian wines, which I would love to try sometime. Tasting Area inside Tio Pepe Storage Building. 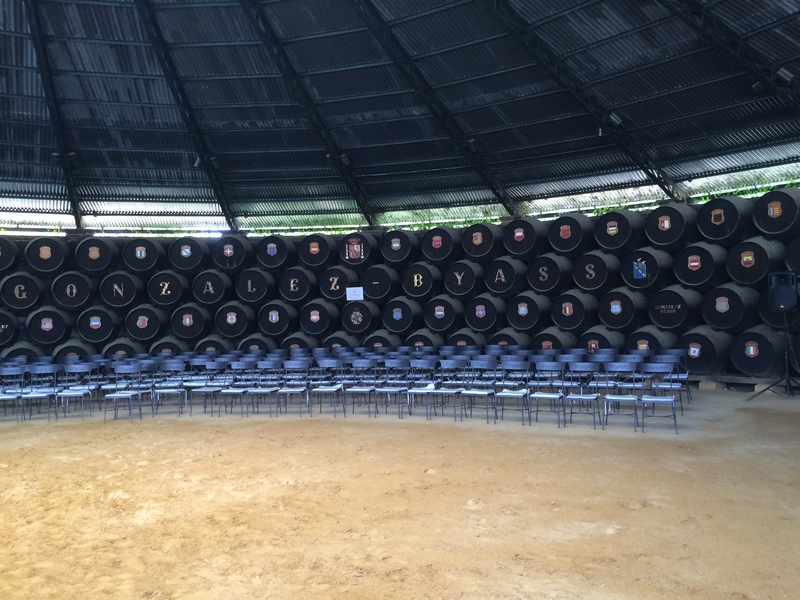 I recommend Gonzalez-Byass for those who want to learn about Sherry production and enjoy the big touristy experience. They do it well. 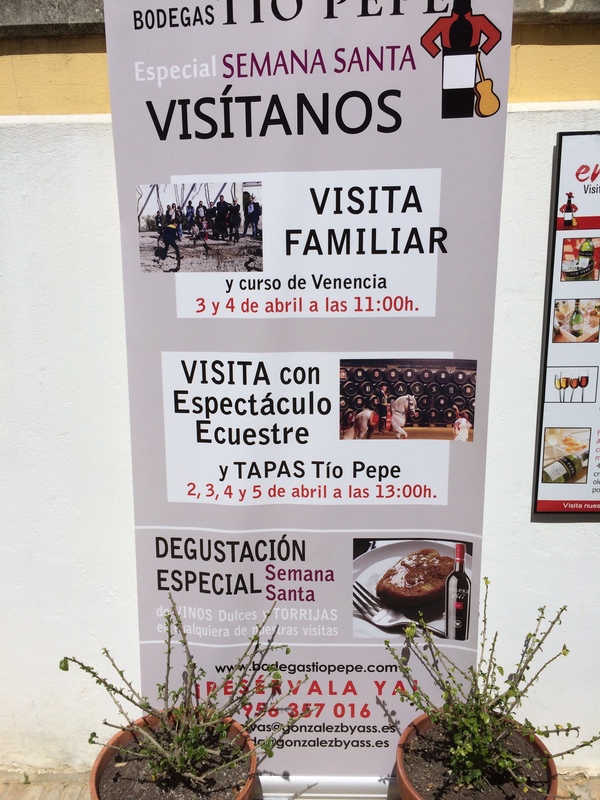 There are lots of opportunities to experience other bodegas in Jerez – just don’t go in Easter weekend! We are in a newsletter with this post!